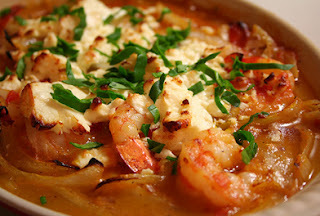 Shrimps With Pasta Garides me PastaThis shrimp pasta recipe is sure to impress friends and family alike! 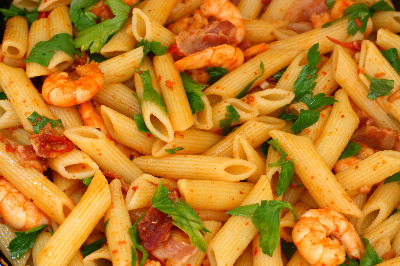 Nutritious, filling and healthy, shrimp with pasta is always a favourite. 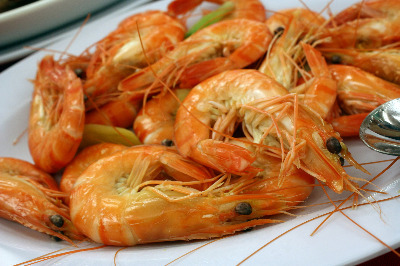 When you don’t have much time, you can whip this prawn recipe up in 30 minutes! This delicious shrimp recipe makes a delicious weekday meal, quick and easy for when you’re in a hurry but want something a little above the ordinary! Add the olive oil to a large frying pan and saute the garlic. Add the bacon and fry for a little longer to crisp. Pour the tomatoes and tomato puree diluted in a small amount of water to the pan. Season with oregano, chopped parsley, sugar and freshly ground salt and pepper. Simmer for about 20 minutes for the tomatoes to soften to a pulp and the sauce to thicken substantially. Meanwhile, bring a large saucepan of salted water to boil, add the pasta and boil according to packet instructions or al dente. 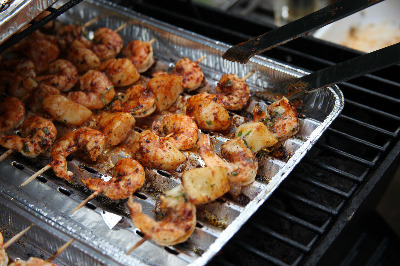 Place all the shrimp in the sauce and stir through. Leave to simmer for another 5 minutes until the shrimp are coated in the sauce and have absorbed the flavours. Place the pasta into a large pasta serving bowl and pour the sauce over. Stir through until all the pasta is coated in the sauce and evenly distributed.